A mild, wet winter looks set to usher in a vibrant Northland spring selling season, with sheep and beef farms in healthy demand. Likewise, horticulture is thriving, and avocado, kumara and kiwifruit properties will attract purchasers. Meanwhile, interest in dairy properties began in early August, including from outside the North. Despite Fonterra’s reduced payout, and the threat of Mycoplasma bovis, enthusiasm for dairy is not dampened. Northland remains a viable region for a first dairy farm, with other farm types also set for spring listing. Supply and demand of rural property appear well balanced so, although an active spring market is indicated, any change in values is unlikely. This winter’s Waikato market was buoyant, with sales equalling and surpassing those from last winter. Across most farm types, prices firmed, though that could reflect the better quality of farms offered compared to last year. Winter enquiry, especially from vendors, indicates a busy spring. With sheep and beef returns positive, buyers outside the dairy sector are confident. Waikato’s horticulture market is also strong. With few of last season’s listed rural properties left unsold and plenty of buyer interest, anyone bringing a farm to the spring market can expect a positive reception, with prices remaining firm. Kiwifruit accounts for much of the Bay of Plenty’s market. Although demand for gold kiwifruit orchards has pushed values above $1 million per canopy hectare, owners are choosing to profit from returns rather than capitalise on values. Spring listings will probably remain scarce. Demand for sheep and beef property is strong. As elsewhere, the dairy market is overcoming negative value perceptions that have prevailed since the general election. Financiers seeking to reduce rural sector exposure are also holding interest in dairy back. Deals are with existing or adjoining owners and market newcomers are less apparent. Farm listings through Taranaki, Wanganui, Wairarapa, Manawatu and Horowhenua were scarce during winter, and likely to remain tight through spring. However, demand for property is steady, mostly from existing farmers and families seeking to expand or establish the next generation. Although interest is from both those outside the region and neighbours, most recent sales have been to local purchasers. Low interest rates are one of the factors motivating buyers. However, these are a negative factor for sellers, as putting sale proceeds into a term deposit is less attractive than continuing to farm, particularly when prices for fat lambs and cattle are so high. A limited number of Hawke’s Bay farms sold in June, with values approaching $12,000 per hectare. As winter proceeded, fewer properties were listed. With sheep and beef income well above last year, farmer confidence is growing. 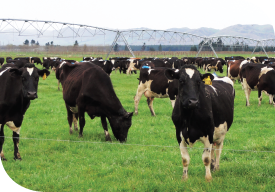 Several farmers in their 60s and 70s recognise this is a good time to sell, including some who held back pending decisions on the Ruataniwha irrigation scheme, which now looks unlikely to proceed. When their farms come to the market, they should attract attention. Meanwhile, interest in forestry land is evident, with lower performing farms drawing interest from corporates intent on planting trees. Their plans and budgets support purchases around $6,000 per hectare.